Ecoscan is a simplified environmental calculator aiming at giving a first estimation of the carbon and ecological footprint of a small organisation. CO2 equivalence Factors used for the calculation are based on the Ademe Bilan Carbone ® methodology (www.ademe.fr), while global hectares factors and ecological footprint calculation are based on the Global Footprint Network methodology (www.footprintnetwork.org/). Ecomapping was developed by Heinz Werner Engel in 1998. It has been translated in more than 20 languages and used by SMEs worldwide in various sectors. Ecotips is a multisectoral database of environmental and economic tips for small and medium enterprises. Possible savings are calculated based on primary assumptions described for each sector you can find these assumptions above each drawing . Each tip finds its sources at the end of the tip page. 2. Who is the Ecotoolkit for? 3. What is an environmental diagnosis? 5. What is the Carbon footprint? 6. What should i expect from this diagnosis? 7. When to use this tool? 8. What data do I need to use the Ecoscan? 9. How to use the Ecotoolkit? 10. What is Ecoscan Lite? 11. 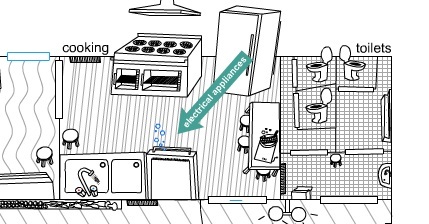 How to use Ecotips? 12. How to navigate through EcoTips? 13. What do the symbols mean? 14. What does it cost to use the Ecotoolkit? Ecoscan is an assessment tool to measure environmental pressure exerted by a business on the environment. This measure is expressed as ecological footprint (global hectares) and/or carbon footprint (tons of carbon equivalent). Ecoscan was developed within the European project Ecotips 2.0 (Leonardo da Vinci - life long learning). This online tool complements EcoTips and Ecomapping tools, available in the EcotoolKit - a toolbox for environmental management. The Ecotoolkit can be seen as a first step for environmental improcements as the approach is consistent with an environmental management system. By highlighting the significant impact that the company has on the environment, the tool can quickly identify environmental action plan and priority actions to implement. Suitable for Very Small Enterprises, the toolkit was designed to assess eight economic sectors. - Small and micro enterprises of the following 8 sectors: offices, bars and restaurants, maintenance and repair, construction and renovation of buildings, accommodations, events, retail, hair salons and beauty salons. An inventory of the company environmental situation to measure the impacts of company activities on the environment and to identify its organizational problems. The diagnosis then allows understanding the causes of these impacts and issues specific to the company and thus, allows implementing the right solutions. This assessment can lead to the creation of a priority action plan to reduce these impacts and eliminate problems. The Biocapacity is the regenerative capacity of the planet. Only part of the earth can create and renew resources and absorb our wastes. This part is said to be biologically productive, the other part, consisting mainly of deserts, glaciers and sea bed has a refresh rate too low. It is estimated the Earth's surface with a biologically productive capacity is about 12 billion hectares, out of 51 billion hectares (total area of the Earth). To measure the ecological footprint, we use global hectares (gha) as an indicator. Gha is a representative production capacity of one ha of land with world average productivity. To find the area available for each human being, simply divide the biocapacity (gha 12 billion) by the world's population (7 billion). This gives us a score of 1.7 gha per person, representing our sustainable footprint. But today the ecological footprint of humanity is 2.7 gha per capita. This is called overshoot, that is to say that we consume more resources than the planet can regenerate and that we produce more waste than it can absorb. The day we exceed biocapacity of the Earth is called Overshot Day and was set this year for September 27, 2011. This means that from that day, we live on credit resources of the planet. We basically contract a debt vis-à-vis the Earth. Moreover, this consumption is highly unequal and thus the debt is not incurred in the same way everywhere, but everyone suffers the consequences of climate change. If everyone consumed like a Western citizen, we would need three planets to support our needs! We can calculate the ecological footprint of the world, country, city, person ... and therefore also that of a company! The carbon footprint measures the amount of greenhouse gas (GHG) emitted into the atmosphere each year on average, for business or living beings, by the use of fossil fuel (electricity, heating, transport,...). The result is expressed in tonnes of CO2 equivalent. The carbon footprint refers specifically to the impact of our activities on climate change. Climate change is due to the greenhouse effect. And the greenhouse effect is enhanced by the emission of gases into the atmosphere. The greenhouse effect is a phenomenon of natural regulation of the planet. Without it, the average temperature on Earth would be -18 ° C instead of 15 ° C.
But the accumulation of greenhouse gases (carbon dioxide (CO2), methane (NH4), nitrous oxide (N2O), hydrofluorocarbons (HFCs), perfluorocarbons (PFCs), sulfur hexafluoride (SF6)) in the atmosphere causes the temperature increase on Earth. • This is more than rethink its organization to have extra expenses. 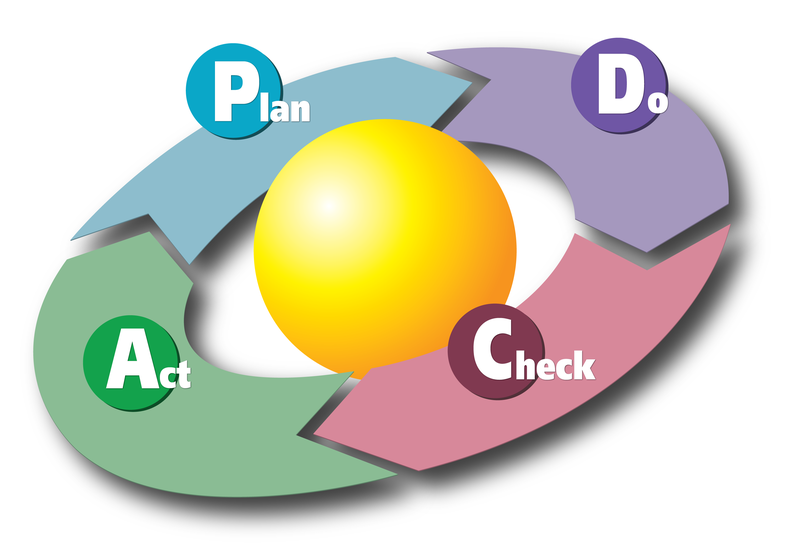 According to the Deming cycle, the environmental analysis is the first step of Plan - Do - Check - Act. Using Ecotoolkit is primarily to plan (Plan) an environmental action program, which will include setting objectives and targets. The Ecoscan diagnostic tool can be used either for a single event (in the case of an event) or for a longer period and therefore ideally once a year at the end of the accounting year. - Km travelled and transport for travel: survey mobility among employees and customers (Click here to download survey template). Once registered, you will receive an email of confirmation. Then you can go to log in. - In case of an annually monitoring, don’t forget to collect data for an entire year. - Indicators can be different on your invoice (e.g, gas consumption can be referred in m³ or kWh – 1 m³ of gas = 10,4 kWh). - Amount of litres can be found if you know the number of kilometres done in 1 year and the consumption of litres for 100 km of your car. - Be careful when calculating the number of kilometres travelled by employees, some of them are not Full Time Equivalent. The amount of kilometres can be calculated in relation with the number of days really worked. - It is not that easy to monitor the amount of waste thrown. If it’s not on your waste managing company invoice, make a projection based on 1 week or 1 month of waste, by using a scale. You can always ask your waste company the average density of one container to evaluate how many kilos of waste per container you generate in a year. Once all data integrated in the calculator, calculate the footprint of your organisation, given as ecological footprint or carbon footprint. The ecoscan will automatically generate a report. The table : useful to get the accurate amount of CO2 emission by field. To conserve your report and monitor again your results in the future. You can compare your reports from year to year. You can see the results and trying to understand the increase or decrease of the figures related to a year or another. Note that you may compare only two reports at a time. We made it possible for you to calculate an even more simplified footprint. When clicking on ecoscan lite, you can generate a lighter version of your footprint by looking only at the major sources of emissions. Please note that for a more complete view of your environmental footprint, we recommend you to spend more time filling up the full version of the ecoscan. The advices of Ecotips are grouped according to the activities of your business. In your office, you use lots of paper. How can you be more sustainable in the use of paper? You will find all of the above activities via the ' office management '. Do you want, as retailer, to reduce energy consumption of your cooling devices? You will find advices in the Cooling activity'! One aspect remains important: profitability. What will this tip bring me financially? For each tip (when applicable) you will find the cost associated to the implementation. • If your company belongs to one of the following 8 sectors: Bars, Snack, and Restaurants; offices; retail stores; beauty and hair salon; vehicle maintenance and repair; building renovation and renovation; hotel or events, you will find related tips by clicking on the desired sector. On the EcoTips home page you can choose your business sector by clicking on the desired area. You will then access a graphic synthesizing the various activities with their actions having related feasible environmental impact. Arrows corresponding to each activity will appear when maneuvering the mouse pointer over the drawing. By clicking on an arrow, you get tips related to the chosen activity. Then using the menu on the left of the screen you can then choose the specific tips. At the top right there is a drop-down list in which the different activities are displayed. To select, press the 'ok' button and available tips for the chosen activity will appear. Using the left menu, you can then choose the tips. Even while consulting an activity’s heading, you can always access any other tips by clicking on the desire activity in the upper green band. In the horizontal blue band under the green band on the left side, you will find symbols. What is their significance? If you click on the €€€ symbol: tips requiring a large (more than 200 euros) investment will appear. Situated next to each tip title (but also located on the menu to the left): by clicking on this symbol, the tip is selected. This means that at the end of your visit on the EcoTips site, a complete list of selected tips is available by clicking on the same symbol located on the left in the blue band. This list can either be sent by email (by clicking on @) or can be printed (by clicking on the printer symbol). By clicking on the respective languages icons you can swithc between Bulgarian, French, English, Slovenian and Estonian. The use of some of the elements of Ecotoolkit is free. Ecoscan and Ecomapping are accessible to everyone, upon registration. However, to have access to the ecotips section, a company must obtain a password from its coach/consultant, based on previous agreement. Lifelong Learning Programe This project has been funded with support from the European Commission.